Newspaper reporter Karen Pope receives a letter from a person who calls himself Cronus claiming responsibility for the murders. He promises to restore the Olympics to their ancient glory and to destroy all those who have corrupted the games with lies, corruption, and greed. 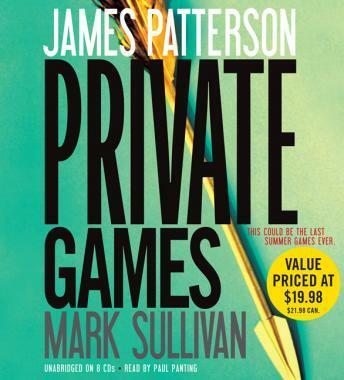 Immediately, Karen hires Private to examine the letter, and she and Peter uncover a criminal genius who won't stop until he's completely destroyed the modern games. 'America's #1 storyteller' (Forbes) delivers an exhilarating, action-packed thriller that brings the splendor and emotion of the Olympics to a wildly powerful climax. Meh. The narration was great in my opinion, but that's where the greatness stops. I read and listen to a lot of Patterson books and typically enjoy them; however, I couldn't wait to finish this book so I could move on to another though. I liked this audio a little the narrator did an ok job. But, the book was TOO predictable. It was a good listen though...Just not a five star book. Just seemed boring, but I like most of his books.